AMMAN, Jordan - Jordan's most organised and powerful opposition movement, already split by internal divisions earlier this year, has further fractured in a fight over property - a dispute that has the Jordanian government openly taking sides. Last March, about a dozen members of the Muslim Brotherhood were expelled because they wanted the organisation to distance itself from its international affiliations. They founded their own group, the government-licensed "Muslim Brotherhood Society", which many believe has the backing of the Jordanian regime in order to undermine the original Muslim Brotherhood, established in 1945. Last month, the government's Department of Land and Survey transferred ownership of seven properties worth several millions of dollars to the Society and sent court orders to the Brotherhood to hand the properties over. Many see the government's actions as dealing a blow to the Brotherhood, whose membership exceeds 10,000 people, analysts say. "We consider the government's transgression regarding the group's properties to be in the context of an official targeting of the group and of its history and legitimacy," the Brotherhood said in a statement via email. "This started by licensing a new organisation under the same name by people who have no leadership status in the group, nor membership in it, and are not entitled to speak in its name." This year, the government, for the first time, banned the original Brotherhood from organising public prayers during Ramadan - a sign that the government now refuses to acknowledge the original group. 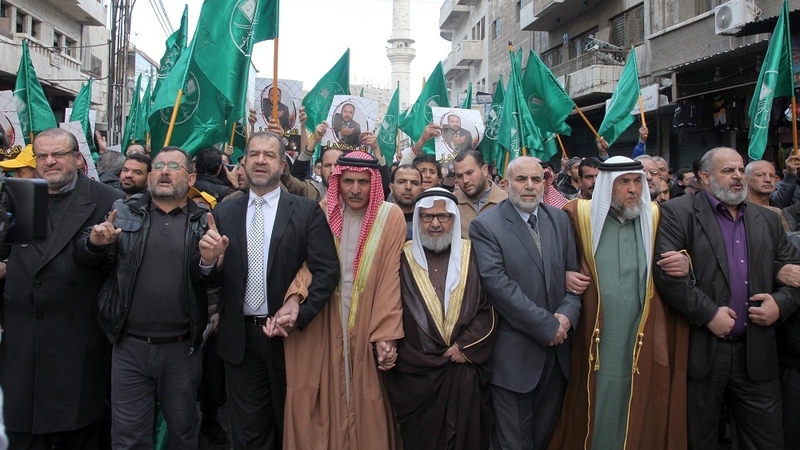 While it was declared a "terrorist" organisation by Egypt, Saudi Arabia and the United Arab Emirates, the Muslim Brotherhood continues to operate in Jordan as an opposition group that is also loyal to the monarchy. Last February, the deputy leader of the Muslim Brotherhood in Jordan was sentenced to a year and a half in prison after criticising the UAE for blacklisting the movement. According to Human Rights Watch, Zaki Bani Irsheid was convicted by a military court in Amman for damaging the country's relations with a foreign country. Hayat al-Museimi, the first female in the Islamic Action Front (IAF), the Brotherhood's political arm, to be elected into parliament and serving in office from 2003 to 2007, said the regime is manipulating the Society in order to align itself with key allies, like the UAE. "The dissident group does not own its decisions," she said. "Its decisions are dependent on the government and others, and this does not suit a group demanding change. "Every small move is dictated by the government - how else would we explain the major support they receive?" she said. Shadi Hamid, a senior fellow at the Brookings Institution and the author of a book on the Muslim Brotherhood called Temptations of Power, said that while the rift is significant, it is a natural consequence of tensions that arose years ago, and is reminiscent of conflicts that began during the 2007 elections. "Some [of those who broke away] feel like they have to distance themselves from the Egyptian Brotherhood and Hamas, realising in such a dangerous time, the best thing to do is to become more compromising," Hamid added. "I don't think this is a major blow necessarily for the Brotherhood. The new group, being smaller and lacking the social infrastructure of the original group, lacks credibility. But, either way, the regime has the upper hand going forward - they are winning that battle." In 2012, Ruheil Gharaibeh founded the ZamZam Initiative, a coalition of moderate and reformist Brotherhood leaders. Some have endorsed the new government-backed group. Gharaibeh, who is also the former deputy secretary-general of the IAF, said that when the group of about 150 members was legalised, it was not co-opted by the regime; This allowed for them to operate under legal protection. "This is a strength for the group and not a weakness," he told Al Jazeera, referring to the support from Jordanian authorities. "They didn't form a new group or new goals, but only added legal legitimacy to the group in its same name, goals and historical record." Some members have expressed a desire to remain separate from the Muslim Brotherhood in Egypt in order to win popular support. "The group has to be part of its nation without following another body, or receive directions and orders from an entity outside the country," Gharaibeh said. Mohammad al-Momani, a spokesperson for the Jordanian government, said in April that the government did not allow the Brotherhood to celebrate the organisation's 70th anniversary because it asked permission under the Society's name, and he pledged his commitment "to implementing the law strictly". He said it was against the law for the Brotherhood to ask for permission under the name of a separate group. Tareq Al Naimat, a Jordanian journalist specialising in Islamist movements and the author of a research paper called The Jordanian Regime and the Muslim Brotherhood: A Tug of War, believes that chaos in neighbouring countries has made Jordanian public opinion wary of change, giving the regime more leeway to control political Islam. "This is an attempt to paralyse the older Brotherhood, keeping them busy with problems so they don't demand political change," he said. "The regime took advantage of the internal differences in the Muslim Brotherhood, and indirectly supported an individual from the reformist wing to create a new entity [the Society] capable of weakening the Muslim Brotherhood." But the Society refutes the accusation that it has been co-opted by the government. "This is a group which will act according to its ideology and what it believes is right," said Gharaibeh, who is also part of the Society. Still, many believe that the Jordanian government is fuelling a conflict in order to become more powerful - a move that may not be conducive for national stability in the long run. "There is an official adoption of this new group, which gets what it wants, and therefore, I expect that the former group will continue to be fought and might be banned - unless a noble intervention takes place in which both groups could exist and have healthy competition," Museimi said. She said the organisation would eventually regain its rights legally, and by reaching out to the public to sensitise them on the issue. "The Brotherhood during Ramadan organised many public gatherings in different provinces... hosted by national figures," Museimi said. "These were gatherings that delivered a message that the Islamic movement's presence is strong, and it cannot be weakened by licensing a group, no matter what group it is. "There is a great presence to the Islamic movement that cannot be violated through a decree." Reporting for this article was produced in association with Round Earth Media, which is supporting the next generation of global correspondents. Tala Elissa contributed to the reporting.